Our 6" tow-behind Brush Bandit wood chipper can reduce your pile of limbs and brush to woodchips in no time. This compact, easy to tow disc style chipper has a large in-feed throat, and is powered by a 35HP Briggs engine. Machine requires a 2" ball or a pintle hook mounted on your vehicle for transport. We do offer local delivery, rates vary by distance. Chipper must be returned full of gasoline or $50.00 deposit will be forfeit. Please use and return key provided. Ear and eye protection strongly recommended. 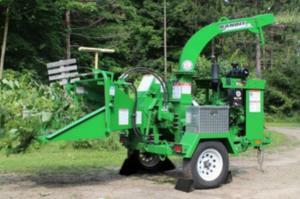 * Please call us for any questions on our chipper 6 inch rentals in Hillsdale and Ridgewood NJ.